Ensemble Signal comes to June in Buffalo 2012! We’re all set to welcome Ensemble Signal to June in Buffalo 2012! 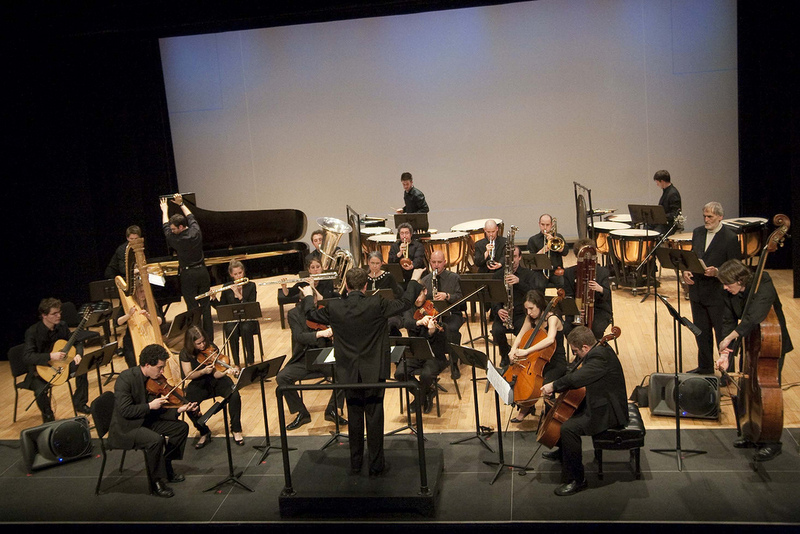 Described by the New York Times as, “one of the most vital groups of its kind,” and TimeOutNY as a “new music dream team,” Ensemble Signal plays a crucial role in today’s world of music by performing, commissioning, and promoting works by a diverse range of visionary composers in the U.S. and all around the world. We’re beyond excited to have them at June in Buffalo this year. On Tuesday, June 5, at 4:00 p.m., in B1 Slee, they will interpret works by June in Buffalo participants Capp, Diaz Infante, Meurant, Naeff, Popeney, and White, and on Saturday, June 9, in Slee Hall, at 7:30 p.m., they will perform La Passione by Louis Andriessen and Impatience by Julia Wolfe. Signal made its debut in Spring 2008 at the Bang On A Can Marathon in NYC and the Ojai Music Festival in California, earning praise for “deeply committed performances” (Musical America) of “gripping vehemence” (LA Times). They’ve been busy touring and performing ever since, and are having an especially active season this year: they played the music of Brian Ferneyhough at Tanglewood, collaborated with Philip Glass Ensemble Music Director Michael Riesman at (le) Poisson Rouge, gave the NY premiere of a new cantata by Charles Wuorinen at The Guggenheim Museum, and premiered a new work by Hilda Paredes written for Signal and Irvine Arditti at the Miller Theatre composer portrait series. Upcoming projects include the commission of a 30 minute work for 20 players by Steve Reich. Signal’s recordings include Philip Glass’ Glassworks and Music in Similar Motion (Glass’ Orange Mountain label); and Sarah Kirkland Snider’s Penelope (New Amsterdam Records). Upcoming releases include a CD/surround-sound DVD of music by Lachenmann, with the composer as soloist in Zwei Gefühle (Mode); Michael Gordon, David Lang, and Julia Wolfe’s Shelter (Cantaloupe); and Reich’s Music for 18 Musicians and pulitzer-prize winning Double Sextet (Cantaloupe). June in Buffalo 2012 welcomes Ensemble Interface! Today we take a look at Ensemble Interface, one of our resident ensembles here at June in Buffalo 2012. On Wednesday, June 6, in Slee Hall, at 7:30 p.m., Ensemble Interface will perform works by Louis Andriessen, Morton Feldman, Beat Furrer, and Fred Lerdahl, and on Thursday, June 7, they will perform works by June in Buffalo participants Chandler, Huffman, Kang, Kelly, Schaul, and Yildrim, in Slee Hall, at 4:00 p.m.
Ensemble Interface is having a very busy year which includes appearances at the Internationale Gesellschaft für Neue Musik Bern, the Internationale Gesellschaft für Neue Musik Basel, our own June in Buffalo 2012 , and afterward will continue on with, among many others, some featured performances at the Internationale Ferienkurse für Neue Musik Darmstadt. Ensemble Interface describe themselves as an international collective of young musicians devoted to the virtuosic performance and innovative dissemination of contemporary classical music. Founded in 2009, they have been quickly recognized as one of the leading young ensembles in Europe dedicated to interfacing contemporary music and culture in Germany and abroad through performance, educational activities, and research. The musicians of Ensemble Interface have worked with some of the world’s foremost composers and conductors including Georges Aperghis, Stefan Asbury, Pierluigi Billone, Pierre Boulez, Martyn Brabbins, Peter Eötvös, Brian Ferneyhough, Heinz Holliger, Helmut Lachenmann, Franck Ollu, Enno Poppe, Wolfgang Rihm, Lucas Vis, Joji Yuasa and Hans Zender, and have enjoyed a close working relationship with German composer and director Heiner Goebbels. They have appeared in some of Europe’s most innovative music festivals including the 45. Internationale Ferienkurse für Neue Musik Darmstadt, Hamburger Klangwerktage, Berlin Ultraschall and Young Euro Classic, Kasseler Musiktage, ROTOR Festival, Klangspuren Schwaz, Transart Bolzano and the Centro para la Difusión de la Música Contemporánea (CDMC) in Madrid and are former soloists of the Lucerne Festival Akademie, among others. 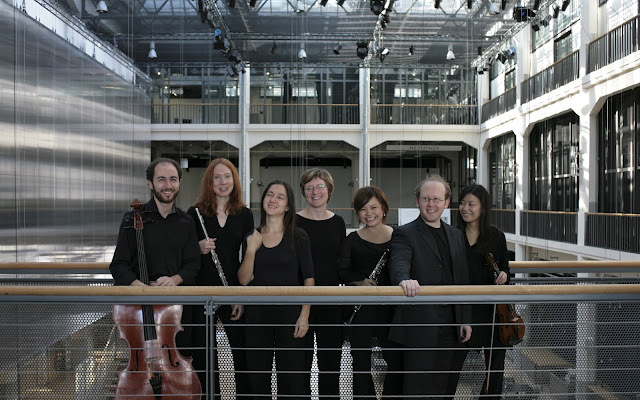 Interface began performing together as members of the 2008/09 International Ensemble Modern Academy (IEMA) in Frankfurt am Main, where they were mentored by the Ensemble Modern.